In a season full of big wins, big disappointments, big comebacks and a big World Series Championship, sometimes it is important to take a step back and take a look at some of the little things that made all of that possible. 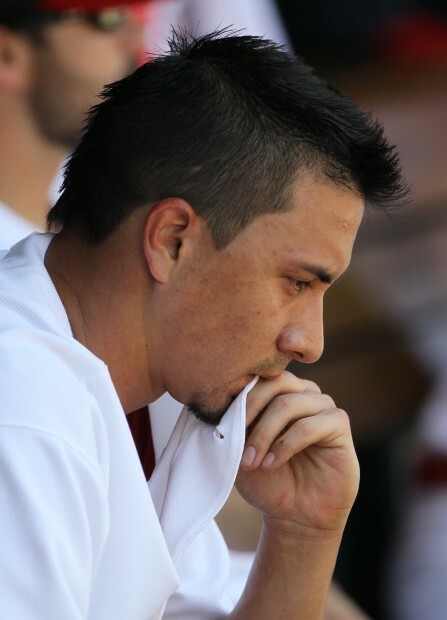 This time, we will take a look at Kyle Lohse. 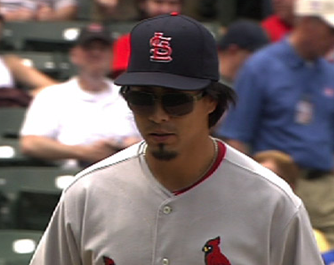 Kyle Lohse, the player that Cardinals fans turn on quicker than Allen Craig on an Alexi Ogando fastball. Guess who led the Cardinals in wins in 2011 ? Oh, that’s right, wins are overrated. 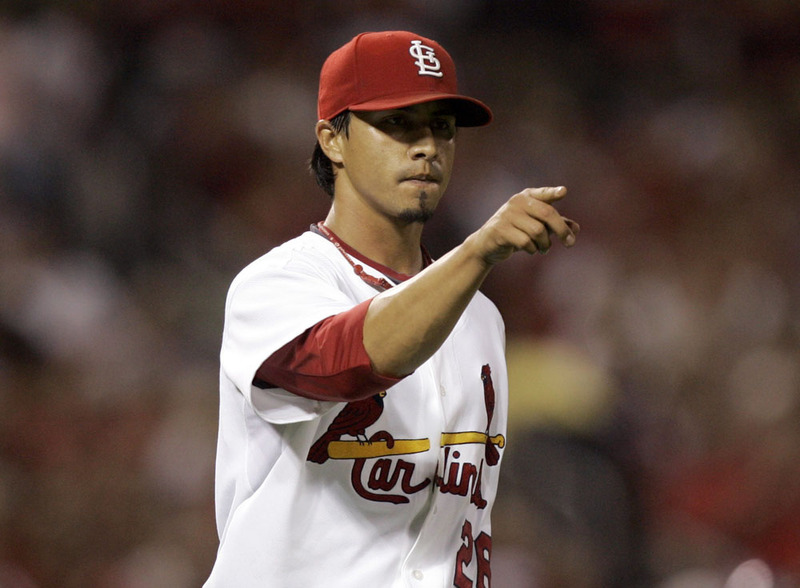 Still, the answer is Kyle Lohse with 14. Who had the lowest ERA among the six Cardinals starters in 2011 ? Again, the answer is Kyle Lohse with 3.39. Who had the lowest WHIP among those same starters, and who had the lowest walk rate ? Kyle Lohse, 1.168 and 2.0/9ip respectively. For a pitcher that fans don’t seem to appreciate, Kyle Lohse had a pretty darn good season. Let’s take a closer look at 2011 and compare it to his first year in St. Louis, thought to be an anomaly. That was the season that earned him the 4 year $40M contract. 2008 doesn’t seem to be that much of an outlier after all. 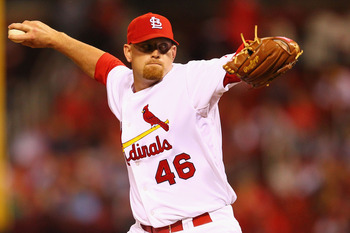 As a matter of fact, Lohse improved his control, gave up fewer hits and lowered his ERA in 2011. If there is a criticism to be found, it was that Lohse didn’t go deep into games, yet he went nearly one out farther in 2011 than he did in 2008 (200/33 vs 188 / 30). With all those big wins in August and September, it may have been Kyle Lohse that started the Cardinals comeback, nearly a week before the team started their amazing Happy Flight run. This was one of the great games in the 2011 season, but it didn’t start out that way, did it ? Oh, no. Quite the opposite, in fact. It was just awful. Let’s take a look back. It all started with an error by Daniel Descalso, playing shortstop. The Cardinals had not yet acquired Rafael Furcal, so Descalso was the shortstop-of-the-day. Starlin Castro would be sacrificed into scoring position. Lohse then worked around Aramis Ramirez, walking him on four pitches. That was not a problem because it kept the double play in order, and the next Cubs batter, Carlos Pena, was a strikeout candidate. Pena worked the count full, eventually walking to load the bases. Marlon Byrd was the next Cubs batter, and he gave the Cardinals a big break by swinging at the first pitch. It was a harmless popup on the infield. There are now 2 outs, and Kyle Lohse is one pitch from getting out of trouble. Unfortunately, that pitch would come three batters later. Giovanni Soto would double home two runs. The big blow in the inning would be a three run homer by Alfonso Soriano. All of a sudden, it was 5-0 in favor of the Cubs. That part we all remember. What we may have forgotten is that Kyle Lohse struck out Tyler Colvin to end the inning. The damage had been done, 5 runs on 2 hits, 2 walks, an error and a strikeout. Over the next four innings, the Cubs would get just one base runner, on a throwing error by David Freese. A couple of balls were hit hard, but most were harmless grounders. 2 of the outs came by way of the strikeout. Lohse would only go five innings on the day because he was lifted for a pinch hitter in the bottom of the fifth inning, but not in a way you would expect. He led off the inning by grounding out, but his spot came up again later in the inning. With the bases loaded and two outs, Tony La Russa chose that moment to deliver a knockout punch, and pinch hit for Lohse. Tony Cruz would walk, forcing in the seventh Cardinal run. Ryan Theriot would follow that with a bases clearing double, making the score 10-5 St. Louis. Lance Lynn would pitch two perfect innings, Octavio Dotel one of his own. Fernando Salas would close things out with a lone blemish, a one out double in the ninth inning. Had Kyle Lohse not toughened and turned his game around, things might have ended much differently. That started a nice run to the end of the regular season for Kyle Lohse. Including this short outing, he would compile a 6-1 record in his last 10 starts, the Cardinals going 8-2 overall. In somewhat of a repeat of his last start, Lohse was torn apart in the first inning. After the Cardinals jumped out to a quick 3-0 lead, the Marlins sent nine men to the plate in the home half of the first inning. Three of the Marlins four hits were for extra bases and Lohse put two more on base with a pair of walks. For all of that damage, the score was tied at the end of the first inning. Lost in the box scores were two more innings where Lohse battled furiously. It was clear that he didn’t have his normal command. Heck, he didn’t have anything. But when he left after three innings, the Cardinals had a 6-3 lead, and were about to add another run. Kyle McClellan, recently moved back into the bullpen, turned in three scoreless innings in relief. Then came the parade of righties and lefties, worked to perfection. St. Louis wins the game 7-4 with Kyle McClellan getting the win. Things might have been much different without those two scoreless innings thrown by Kyle Lohse. Things were starting to get tense as Cardinals fans keep looking at the standings in disbelief. Even the Wild Card seemed unlikely at this point. Even more so after the first two innings in this game. As with the two previous games, Lohse got off to a rough start. The Pirates managed to score a run before Lohse could record the first out. A single, walk and RBI single by Andrew McCutcheon gave the Pirates a quick 1-0 lead. Kyle Lohse then struck out Neil Walker and coaxed an inning ending double play out of Garrett Jones. This time the Cardinals gave Lohse some help by sending eight men to the plate in the home half of the first inning. Three of them scored, giving Lohse a nice 3-1 lead. That didn’t last long as the Pirates roared back into the lead with three runs on a pair of doubles, a single and two groundouts. Once again, Cardinals fans grew impatient with Kyle Lohse. And once again, Lohse prevented any further damage. He would retire the next nine men he faced before turning things over to the bullpen in the sixth. Ryan Theriot and Allen Craig were the offensive heroes, making a winner out of Lohse. Marc Rzepczynski, Kyle McClellan, Arthur Rhodes and Jason Motte would combine for 4 scoreless innings, preserving the win for Lohse. Once again, had Lohse not turned the game around and prevented further damage, the game and season might have ended much differently. Who could forget this gem of a game ? The Cardinals had gone into Philadelphia what could have been a preview of a possible divisional series. Possible but improbable because the Cardinals were still 3 1/2 games out with just 10 left to play. The two teams split the first two with Kyle McClellan earning a win in extra innings and Jake Westbrook taking the loss. In the third game, Chris Carpenter pitched 8 scoreless innings to defeat Cole Hamels. The series and perhaps the season now rested in the right hand of game four starter, Kyle Lohse. 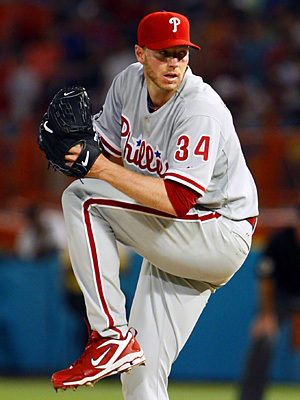 His opponent – Roy Halladay. On paper, this was a beating waiting to happen. Reality was something altogether different. A leadoff double by Rafael Furcal got things started quickly for the Cardinals in first inning. Furcal would take third base on a passed ball, and then score when Nick Punto grounded out. With two outs, Lance Berkman would extend the lead to 2-0 with a long solo home run. Didn’t these two guys also get to Halladay in the NLDS ? Hmmmmm. Spooky. The Phillies would get one of those runs back in the second inning, thanks to a Nick Punto error on a fielders choice. The first pivotal moment in the game came when Kyle Lohse struck out Roy Halladay to end the inning. The Cardinals would get that run back in the next inning, and it all started with a leadoff double by Kyle Lohse. Once again, it would be Lance Berkman with the big two out hit. The second and significantly bigger moment came in the bottom of the third inning. With one out, the Phillies loaded the bases on a pair of singles and a throwing error by Daniel Descalso. The Phillies were one hit away from breaking the game open, and it seemed as if Lohse was a long way from getting out of trouble. It took some great pitching and Kyle Lohse was able to strike out both Raul Ibanez and Placido Polanco to end the inning. Kyle Lohse was never in trouble again in the game as he pitched into the eighth inning. The Phillies would get a pair of runs off Jason Motte in the ninth to make the game score seem closer than it really was. Kyle Lohse earns the win, defeating Roy Halladay. More important, the Cardinals took three of four in Philadelphia. If the two were to face each other in the NLDS, these wins might give the Cardinals the confidence they need to win the series. This was the game of the year and it featured the moment in which Cardinals fans could first allow themselves to believe postseason might really happen. We all know how this game ends, with a bases loaded walk and a wild pitch by Cubs closer, Carlos Marnol. Let’s not forget how it all started, 2 hours and 36 minutes earlier. Kyle Lohse was on the mound for his final start in the 2011 regular season. Three singles by the Cubs in the first inning gave them a quick 1-0 lead. Over the next six innings, Kyle Lohse would allow just three more base runners, all on singles. None of them got as far as second base. Two more scoreless innings by the combination of Octavio Dotel, Marc Rzepczynski and Jason Motte set up the exciting finale of this game. Had Kyle Lohse not thrown those six brilliant scoreless innings, the game and season might have ended much differently. Thanks to my buddy, Andy Gustavson, for reminding me about this one. Kyle Lohse’s greatest performance in the 2011 season did not happen on the mound or at the plate, but before the start of this Jaime Garcia gem. Cardinals manager, Tony La Russa, had been battling shingles and it had finally reached a point where he could no longer be with the team. After a terrible 11-4 beating by the Cubs the day before, the players urged Lohse to impersonate Tony La Russa for the lineup exchange, and the big right hander responded brilliantly. With his hair all fluffed out to mimic the skippers protruding locks, Lohse put on a #10 jersey, pair of dark sunglasses and stomped out to the umpire meeting as if he were the manager. It was just what the team needed, and they responded with an impressive 9-1 win in the series finale. It should be noted that Lohse had just won four games in a row and was sporting a 4-2 record with an ERA near 2 when he did his impersonation. Had he not started the season so strongly, it would have been Joe Pettini carrying out that lineup card, not a fake Tony La Russa. Fortunately, we can look back at Kyle Lohse’s season and see all of the wonderful contributions he made. He was brilliant in 2008 and until injured in May 2009. Finally healthy again, he returned to his 2008 level, perhaps just a bit better. There is no reason to expect anything less in 2012. What happened in at the end of 2009 and nearly all of 2010 no longer matter. 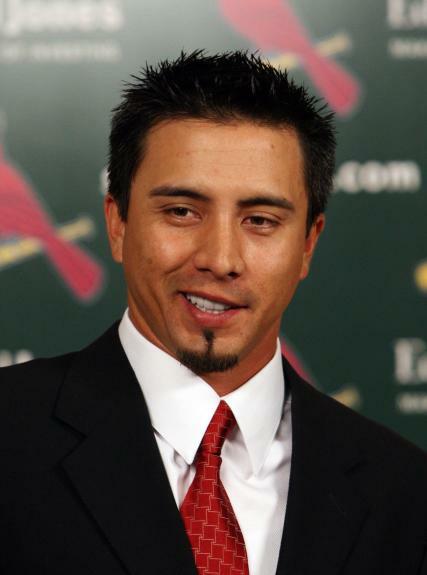 Kyle Lohse can now smile because he is a World Champion. This entry was posted in 2011 Season and tagged 2011, baseball, cardinals, kyle lohse, redbirds, st. louis, St. Louis Cardinals, stlcards, World Series. Bookmark the permalink. How about the May 12 TLR impersonation ? Thanks Andy. You are right, that was brilliant. I have gone back and added a note about that, thanks to you. Much appreciated!